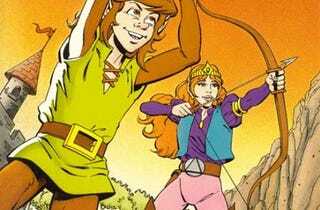 There was a Zelda animated series, and it was terrible. Let’s not dwell on it. But if you ever wondered what would happen if the same art style ditched the excuuuuuuuuuuuse me’s and played things a little straighter, you should know that such a thing actually exists. It’s The Legend of Zelda comic, released in 1990 by Valiant as part of the Nintendo Comics System series (and catalogued excellently by Zelda Wiki). Beginning in February of that year and running for six issues, each comic contained two stories, along with bonus material that either consisted of shorter tales or things like detailed maps of the universe and its regions. The primary plotlines, while using a similar art style to the ill-fated animated series, were actually much closer to the more serious tone found in the Zelda games of the time. The world is in peril, bad things happen, and there’s even a two-part run where Link is consumed and corrupted by the Triforce of Power, to the point where he begins to resemble Ganon, pig face and all (left). Serious Zelda fans may also appreciate the lengths the comics went to flesh out the Zelda universe. Long before Ocarina, Majora’s Mask, Wind Waker, Twilight Princess and Skyward Sword took Link to wild and vividly different places, these comics were dreaming up new kingdoms and worlds to explore. They even tried their hand at providing a little canonical back story, introducing the world of Calatia, a neighbouring Kingdom where Link and his parents Arn and Medilia came from. There were also attempts at showing off how he got hold of so many weird weapons, an early debut of Shadow Link (who didn’t appear in a game until Four Swords) and even a special two-part series where Link and Zelda go on a date (and Link gets into a barfight). They’re also notable for the way they depict Princess Zelda herself (above, below); almost a decade before her undercover badassery in Ocarina of Time, Valiant’s comics break from her usual damsel-in-distress trope and portray her as bold adventurer, who risks her life in battle alongside Link and is more than capable of handling herself regardless of what Ganon (or the series’ other minor villains) throw at her. Not everything about the series is made up of fond memories and pioneering plotlines, though. The man chiefly responsible for the Zelda comics—writer George Caragonne—would see his association with Nintendo set him on a path to a tragic and untimely end.Caragonne—would see his association with Nintendo set him on a path to a tragic and untimely end.Caragonne—would see his association with Nintendo set him on a path to a tragic and untimely end. Having got his start in the business dabbling on licensed properties like GI Joe and Thundercats, he went on to pen many of Valiant’s line of Nintendo comics (he even helped establish the company). Yet he didn’t stick around long. Caragonne soon left to start up a new label with...Penthouse magazine. After a few years writing there, first for the magazine and then for its spin-off comics label (in which he surprisingly found a great deal of success), Caragonne was fired for “financial impropriety”. Accounts suggest that the success of Penthouse’s comics had led him to a life of heavy partying and drug use, and it was alleged he’d begun stealing money from his bosses to help support his new lifestyle. Shortly after he was fired, and with neighbours saying he’d become upset that “associates had stolen an idea he had for a comic book”, Caragonne took a lift up to the 45th floor of the Marriott Marquis in Times Square, put on a Walkman (the James Bond theme, apparently) and leapt 500 feet to his death. You can read more about these comics, and see images of their contents, at the Zelda Wiki. Total Recall is a look back at the history of video games through their characters, franchises, developers and trends. This post originally appeared on March 3, 2012.